You may have heard the two Demien tracks on Jazzy Jeff's recent "Soul Mixtape" and wanted to quickly find out more about this artist like I did. The two tracks stand out in an impressive collection for there songwriting ability but also intricate production. The two tracks are taken from Demien's album "Supernova Syndrome." The album is a great collection of musical styles from Soul and RnB to Rock and Funk with Demien's creative talents shining through on each carefully crafted track. Demien has been on an interesting musical journey which involved working with artists such as Boyz II Men and being signed and released from Elektra before he finally released his first solo album. During his childhood he performed with the Pasadena Boys Choir and the Harlem School or Arts. By the time he left high school he had begun writing and recording his own tracks and was proficient in more than 10 instruments. He was signed and eventually dropped from Elektra records with his album shelved. During this time he continued with production on other artists projects and in 2003 joined A Touch of Jazz in Philadelphia. Demien has worked as a producer on albums such as Boyz II Men Throwback, Carl Thomas' Emotional and Let's Talk About It, Mary J Blige The Shark Tale Soundtrack, as well as working with artists Jamie Foxx, Herbie Hancock, Jazzy Jeff, Glen Lewis, Raphael Saadiq, and Jill Scott. Demien has now set up his own label Generation D music and has begun working on his second album. He may have been through a lot of ups and downs of the music industry but with the talent Demien posseses as a songwriter, producer and artist his musical journey is just beginning. Demien was kind enough to give us the following interview. I'm a music lover, so I have a wide range of influences musically. Stevie Wonder, Sly and the Family Stone, Al Green, the Beatles, Prince, just to name a few. I love Hip Hop. Period. Groups like The Jungle Brothers, JJ&FP, Doug E. Fresh and Slick Rick, Run DMC, I grew up on as well, so I was heavily influenced by that and was able to come up appreciating Hip Hop as an art form, so I try to incorporate elements of that in my music. Why did you set up the Generation D label? Basically out of necessity. I was signed to Elektra and did a record, which basically got shelved because it was a little too "eclectic" (to use their words). I started to realize that creativity doesn't't necessarily equate to success to a record label. I needed an outlet to release my music, and I wasn't't getting any love from any labels after I got released from my contract, so I decided to do it myself. What defines you as an artist and a person? Wow. That's a hard one. My love for music definitely defines me as a person and artist. I strive to keep my art interesting, and to not be afraid to try different things musically. I think the one thing that defines me musically is the fact that I enjoy making music so much that I never want the music to suffer or take a back seat. I tend to be a perfectionist in the studio, so I can be a bit of a control freak, but the end result is what I most concerned with. I think that as a person, I'm a little more easy going. "Sometimes its cooler to just play straight and in the pocket"
You can play a lot of musical instruments, what are you most skilled at? I dunno. Some days I feel like I'm an alright guitarist and then I listen to some Stevie Ray Vaughn or some Hendrix and then I realize that those guys are guitar players FOR REAL!!!!! Some days I think I'm a decent drummer, then I listen to Art Blakey or Max Roach and I throw the sticks down in frustration. Some days I feel like a good piano player and then a dude like Herbie Hancock will come down to the studio and play a couple of chords and I'll feel like I'm playing "Chopsticks". I think my best skill as a musician is being able to listen and fit in where appropriate. Musicians tend to want to show off their chops, but sometimes its cooler to just play straight and in the pocket, so that's what I try to do. How does your ability to play many instruments effect your production? It definitely helps my production. I've worked with a lot of producers who weren't't musical. Sometimes it's difficult as a musician to play what someone else has in their head. Sometimes they don't know what they want to hear until they hear it. It's definitely a process. As a producer and a musician I can get out my ideas and put the different elements in like I hear them in my head. Did you record an album for Elektra, why did they drop you? Yep. Like I said before I was signed to Elektra. I don't think they realized the scope of what they were dealing with when they signed me LOL! They basically didn't hear anything that in their views could be commercially exploited, and I was a classic artist, headstrong, emotional and oblivious to the business aspect of the record industry. I was concerned with making music and expressing myself. I started getting frustrated and I think they were getting scared that they weren't't gonna be able to sell the record. I had become more that a little audacious so I was "released" from my deal.after a couple of years. (little thing called subversion). Kids be nice to your bosses, even when you disagree! Will you continue as an independent artist on your own label or would you sign to another major label if you had the chance? If I had the chance, the business added up, and I was able to retain creative control, (among other things) I would sign a major deal. Ideally I would like to find major distribution for Generation D and operate it as a boutique label, sign some new and veteran talent, and make some great records. How did you end up at A Touch of Jazz? producer and I jumped on the opportunity. When did you actually write Amanda Blue? Can you tell us more about that story, Amanda and the development of that track ? I wrote Amanda Blue around 1991-92 while I was in college. The actual story of Amanda Blue came from two different sources. When I was in high school, one of the people in my circle of friends killed himself. It was a big shock to the school, but it was an even bigger shock to the people that knew him cause he was a supersmart guy and there weren't't any signs that he was even thinking of doing something like that. Anyway, I just remember the whole thing having a really profound affect on me, which eventually came out in the song. The other part of the song came from an old story that my grandfather used to tell me while I was growing up about slaves escaping to a particular cliff in Trinidad where they had intended to fly to freedom. That phrase "fly to freedom" always stuck out to me, and every time he would tell the story I would ask. "How did they learn to fly?" And every time he would tell me, "Back then they taught everyone to fly..." I wanted to write something that would be my interpretation of a person who was flying to freedom, but in a story with a character that was very visual. Amanda is a amalgamation of all of that. 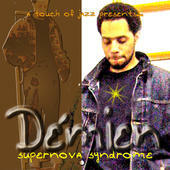 Supernova Syndrome seems to be a very eclectic mix of sounds, does that come naturally to you? Definitely so. 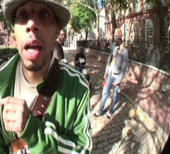 The first time I heard someone say that in references to my music, I was like "wha?? It doesn't't sound eclectic to ME! But that's just my thing. I appreciate a lot of different types of music, so that tends to come out in my records. What have you learnt from working with other artists? the best out of the artists I work with. I think the greatest thing I've learned from other artist is to stay true to yourself and find your own niche and perfect it. You are a really strong writer, how have you developed that skill? are the ones that are simple, straight forward, and honest. I tend to borrow from a lot from different sources just kind of as homage to people that inspired me to write. The industry is what it is. It's a marketplace for consumption. Labels don't really focus on artist development anymore. It's just not cost effective. The music tends to take a back seat to image, and packaging. Talent, as P. Diddy would say, is just the icing on the cake now, whereas it used to be the main ingredient. On the flip side you have artists that are already developed and trying to put out stuff and they meet resistance from their label cause it's too much work and too many dollars for them to figure out how they're gonna sell it, and who they're gonna sell it too, and all that good stuff. Great albums get shelved. I think that the industry stands in the way of more talent that it puts out. Enter the Internet. Suddenly there is an outlet for artist to be heard. Albums can be recorded at home and uploaded in the same week. So I guess at the end of the day it balances out. Will you be doing any touring over the next year? I'm in the process of trying to put some dates together in a couple of different places. I'd really like to put on a "show" that takes planning and tour support, so I'm working to make that happen. For those who haven't got "Supernova Syndrome" can you describe the album, What's it about, what can people expect? Are you working on a new album, What's next for Demien? would like to release and sign some new talent in 06. For the most part staying creative and keeping it moving! Peace! Make sure you buy the album Supernova Syndrome! Thanks to Demien for a great interview!